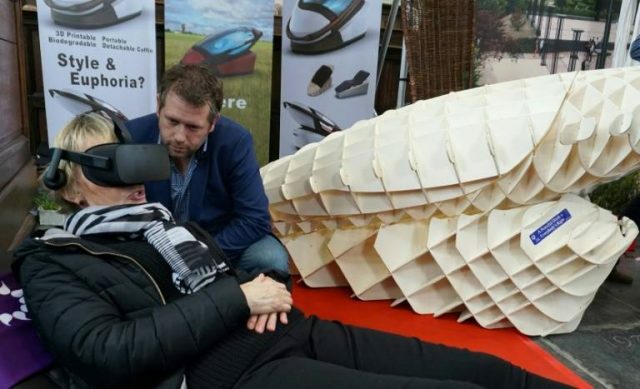 A controversial suicide pod that enables its occupant to kill themselves by pressing a button was displayed at Amsterdam funeral show on Saturday, reported AFP. Called the ‘Sarco’, short for sarcophagus, the 3D-printed machine invented by Australian euthanasia activist Philip Nitschke and Dutch designer Alexander Bannink comes with a detachable coffin, mounted on a stand that contains a nitrogen canister. “The person who wants to die presses the button and the capsule is filled with nitrogen. He or she will feel a bit dizzy but will then rapidly lose consciousness and die,” said Nitschke, who has been dubbed ‘Dr Death’ for his work to legalise euthanasia. The ‘Sarco’ is a device “to provide people with a death when they wish to die”, Nitschke told AFP. The inventors put a model of the device on display, together with a set of virtual reality glasses to give visitors a true-to-life experience of what it would be like to sit in the pod, before ultimately pressing the button. Nitschke said he aimed to build the first fully-functioning pod before the end of the year. Along with this device, the designer should also design a device for shifting the soul of dying person to a already dead person who may not have left a will when alive and live to enjoy second life/relationship etc.